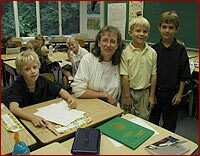 Valley School of Ligonier is a coed day school for children in grades K through 9. Nestled in the 400 acres of forestland near Linn Run State Park, Valley School prides itself on academic excellence in a family-oriented setting. In an environment that is safe, challenging, nurturing, and disciplined, Valley School provides a balanced and strong program of study for a diverse group of children. Our goal is to stimulate in each young person lifelong habits of moral behavior, seeking knowledge and understanding, and doing good works for others.